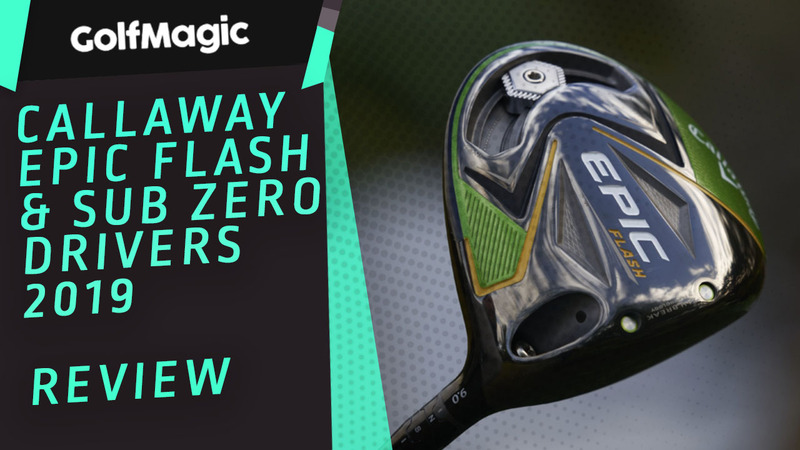 GolfMagic reviews the new Epic Flash and Epic Flash Sub Zero drivers from Callaway. With a lot of drivers being launched onto the market this year, the Callaway Epic Flash was one we were really excited about. The technology behind it was unheard of, with the use of Artifical Intelligence to cycle through 15,000 iterations before coming up with Flash Face. Now this one causes a lot of debate... Green and yellow are not colours that Callaway are known for, so when everyone first saw the Epic Flash, it caused quite a stir. Personally, we think the driver is bright, bold and certainly stands out amongst a lot of other drivers. Colour aside, the head size is excellent, not too big and not too small, so you're full of confidence when the ball is at address. The Sub Zero head is slightly smaller, suited more for the lower handicap players. The Epic Flash felt great, but the Sub Zero head had a slightly better feel. They were both really responsive with off-centre shots, so you could feel straight away if it had been pured or caught slightly off centre. The sound is definitely louder than a lot of other drivers, but it's a welcomed explosive sound that excites you when you've smashed one out the middle. Both the Epic Flash and the Sub Zero performed brilliantly. Callaway has produced a driver that helps you reach speeds that you didn't think were possible. The Epic Flash offers distance, forgiveness and a high trajectory that some players love, but the Sub Zero was the perfect head for us, as it produced a lower spin rate, providing the bullet launch that we prefer, making it slightly less forgiving. If you're wanting to invest in a premium driver that you can rely on then the Callaway Epic Flash is the driver for you. No driver will magically make you hit the ball better, but this driver certainly helps you hit it further. Even off-centre shots were still flying out there, so the combination of Jailbreak and Flash Face technology, makes the Epic Flash a true beast of a driver. Click here for more information on Farleigh Golf Club. WATCH: Italian golf commentators go CRAZY for Molinari's putt at 18! Golf Drivers Guide: 10 things to know before you buy your next driver! The most CRITICAL layup shot that was NEVER shown at The Masters! WATCH: Tiger tells Rory during golf shoot - "JUST HIT THE DAMN THING!" Crash Media Group Ltd 2019.